The latest book review by Gabriella Dessanti is here, and it's so beautifully written. See more of her reviews here, here, and even on the Josie's Juice sister site TwinnieWorld here. The title of this novel is what grabbed my attention. I love Paris; it resonates romance, art, culture enchantment, happily this novel delivers on most counts. I had expected Paris to play a prominent role in this novel; however it shrewdly plays a more subtle one. It is the magnet of love and passion, where the heart and soul of a person resides, leaving Paris means shedding a key aspect of oneself, and it is only when the characters reunite in Paris in the end that they finally reconnect with their own hearts. Annie is engaged to a Marine about to leave for Afghanistan, just after events of 9/11. On the precipice of marriage, she challenges her mother to give her answers about her unknown father which she has never questioned previously. Annie’s’ mother has seemingly appeared to her daughter to have a led a “life that went in a straight line” a career woman and single mother, yet the experiences that defined Laurel prior to motherhood, particularly her love life have been fiercely guarded with her silence. It is with Annie’s discovery of an ancient book amongst Laurel’s possessions titled “the missing duchess”, that ignites a quest of self-discovery, as she unlocks the truth of her mother’s past, the mystery of her dad and solidifies Annie’s own direction in life. When Annie follows her mother on a trip to Banbury, Oxfordshire, there for a family business transaction, it is intriguingly the setting where the Duchess spent her later years in life. Laurel is too absorbed in her mysterious business which conveniently allows her to remain evasive of her Annie, leaving Annie to her own devices. Annie spends her time reading the book and makes her own private investigations into the riddle of the Duchess, seeking out her former home, The Grange. Annie visits the local pub and meets Gus, a man who knew the Duchess and her biographer; he gives Annie valuable insights and stories behind the making of the biography. The book moves through the present 2001 and 1970’s then later in the 1980’s where the past comes to life through Gus’s recounting and also interview transcripts and recordings that Annie finds through her investigations. I found the transitions a little clumsy at times, having a story within a story didn’t really allow for a strong connection with the main characters. What kept my interest was the enchanting and mesmerizing historical figure which Gable deftly weaves into this fictional novel. Gladys Deacon, the Duchess of Marlborough is an intriguing woman. Whilst living in her dilapidated Grange home the duchess called herself “Mrs Spencer” and was known for shooting at and shouting obscenities to locals. She claimed that Tom lived there with her, a man whom locals had never seen in years, adding further mystery and intrigue- is Mrs Spencer insane or does the man actually exist? In her earlier years having led the Parisian way of life in eminent social circles, the duchess whose beauty was legendary and who was painted by Giovanni Bodini, had incalculable lovers. She has been quoted as saying “of course I’m well informed! I’ve slept with eleven Prime Ministers and most Kings!”. Using her extensive knowledge of love she spearheads her personal assistant’s romance with the biographer. It was an enjoyable read with an unexpected beautiful twist at the end. I am looking forward to reading Gable’s first novel. Rating: 3½ stars out of 5. 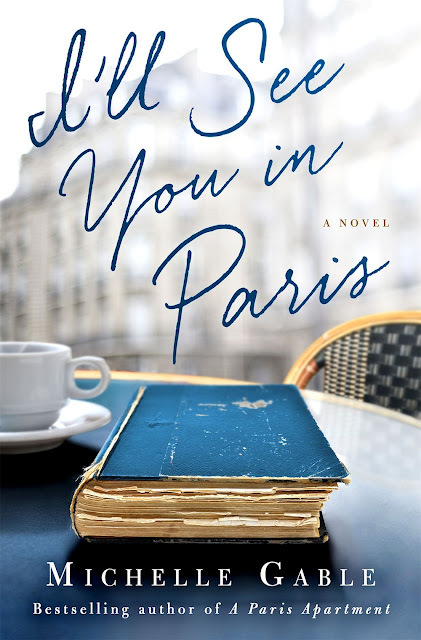 'I’ll See You In Paris', by Michelle Gable is out now through Pan Macmillan Australia. Michelle Gable graduated from the College of William & Mary. She currently resides in Cardiff by the Sea, California, with her husband, two daughters, and one lazy cat. A Paris Apartment is her first novel. Are you paying more than $5 per pack of cigarettes? I buy high quality cigarettes over at Duty Free Depot and I save over 60%.